Whether you work in the agricultural sector, pharmaceutical industry or manufacturing and production, Arlyn has the right scale to fit your industry’s needs. We have been providing industrial weighing solutions to a variety of industries in the United States for over thirty years and manufacture a wide range of weighing equipment constructed from aluminum, steel, stainless steel or a combination of these materials. 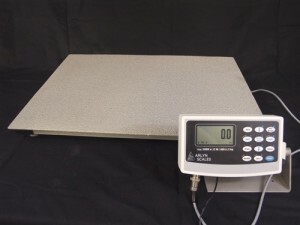 We’ve listed our most popular weighing equipment below. It’s important to note that the most important part of a scale, known as the load sensor, is made from stainless steel to ensure maximum ruggedness. Not all scale platforms are constructed of the same materials. Aluminum, steel, and stainless steel each have different characteristics and determine the type of coating you can use to protect it from corrosion and rust. Arlyn Scales are proud to feature Ultra Precision Scales as our star product which leverages a superior new technology called Surface Acoustic Wave, or SAW technology. In certain industries, it really is necessary to have a low profile platform or floor scale, which not only reduces the height of the platform and makes it easier to load and unload, but also saves space and improves safety. The agricultural sector and airline industry are two examples of industries that should opt for low profile floor or platform scales. If you’re a farmer, you’re likely to be in need of a low profile scale which will allow you to easily monitor animal weight gain and health. Heavy livestock need a scale they can easily step up onto to be accurately weighed. Similarly, if you’re dealing with heavy luggage, you should consider a low profile platform or floor scale that will make it convenient for your employees and customers to lift luggage and land it on the platform without injuring their backs. Will Arlyn Scales Corrode or Rust? If you’re a fisherman and are concerned about corrosion from seawater, or even if you have to work with harsh products such as solvents, acids, fuels and other corrosives, Arlyn manufactures corrosion resistant scales to ensure your scale will last. We have two protective platform coatings available to protect it against corrosion and rust. Zinc Rich Galvanized Epoxy – Sets Arlyn Scales apart from its competitors as the zinc rich epoxy makes it more durable and less prone to scratching than the hardware store paint often used on scales. While it’s inevitable that the platform will be scratched, the zinc in the epoxy guarantees the rust will be inhibited and contained vs. exposed and vulnerable to spreading. 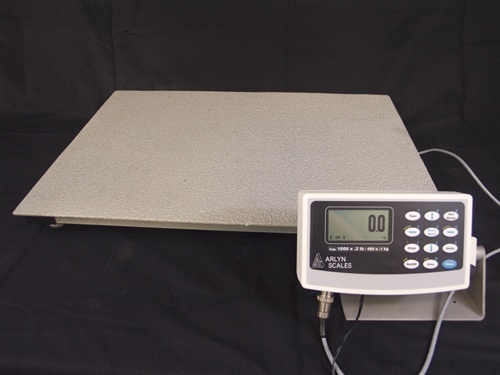 Standard on all Arlyn steel floor scales and only available on steel models. Triple Epoxy with Mica Particles – Base is a polyamine epoxy which is very resistant to most hydrocarbons, inorganic acids and alkalis, solvents and other chemicals. A garnet powder is mixed into the epoxy to provide abrasion resistance. Only available on stainless steel models. Gone are the days when you had to sacrifice high resolution for high capacity or vice versa. Arlyn Scales has developed a brand new technology referred to as Surface Acoustic Wave, or SAW technology which gives our customers options. We’ve integrated SAW technology into our Ultra Precision Scales, and the result is that our customers no longer have to make a choice between high resolution and high capacity scales. Nine times out of ten you won’t need the absolute precision of a SAW scale. If you work in the paint mixing, chemical or pharmaceutical industry, however, you should consider this option as anything less than an exact reading could result in the wrong shade of paint color or worse yet, a bad drug lawsuit. Why Opt for Ultra Precision Scales? So, how exactly does it work? What sets our Ultra Precision Scales apart from the rest? The difference is in the load cell. Think of the metal load cell as a kind of specially machined spring within the scale that bends when a load is placed on the platform. The spring, or metal, bends and determines the amount of stress or strain by how far it bends. The strain gage load cell was the most popular type of load cell until Arlyn Scales introduced Ultra Precision Scales and its advanced SAW technology to the market. The difference between the two technologies is that the spring in the SAW load cell only needs to bend by a fraction of the amount as with the strain gage load cells and therefore can be quite thick. The thinner load cell in the strain gage lacks the ability to stretch far enough to get an accurate reading and may get damaged in its effort to do so. On the other hand, Arlyn’s thicker load cell in its Ultra Precision Scale is less prone to damage by shock loading or overloading. Do you rely on viewing and collecting weight data from your scale? We’ve got you covered. Ethernet Ð Monitor and control scales by plugging in or wirelessly connecting to a local network using our Remote Indicator Software. Access from anywhere in the world using the Internet. USB (Universal Serial Bus) – Weight data is sent to a Windows Excel or Access database file on a PC via our free USB Remote Software. Most common PC interface. Datalogging – Uses a thumb drive to capture weight data, facilitate storage and retrieval. Ideal for mobile and field work. Headquartered in Long Island, New York, Arlyn Scales is a scale manufacturer that leads in the design and development of technology for the weighing industry. We design and fabricate all of our own subassemblies including load cells, microprocessor instrumentation and computer software. We also ship products factory direct which eliminates price markups from dealers. Contact us toll free at (800) 645-4301 or simply fill out our contact us form for more information.